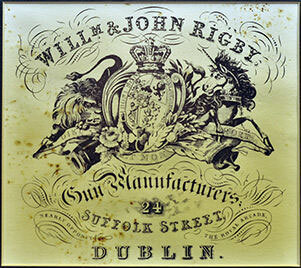 John Rigby & Company, is the third oldest Gunmakers in the world, founded by John Rigby in 1775 Dublin. The company is now located in central London and is under the direction of Marc Newton and Patricia Pugh. Part owned by and working alongside Mauser, the two companies are currently working on the development of a new model Rigby rifle for big game hunting. The company was founded in Dublin, Ireland in 1735, and is known to have traded as W. & J. Rigby during the period 1820 – 1865 during the flintlock and percussion eras. In its early days, Rigby’s was particularly well known for producing high-grade duelling pistols. Around 1880, John Rigby became superintendent of the government Royal Small Arms Factory at Enfield Lock, and was in charge of development of the British service issue .303 British calibre rifle. He was a distinguished rifleman who had competed at international level with the Irish team, and was mainly responsible for bringing Rigby’s name to the fore in rifle making. Rigby landmarks include the 1897 introduction of the .450 calibre Nitro Express Double Rifle; the 1899 production of the Rigby .275 calibre (7×57 Mauser) built on the Mauser action and the Rigby .350 calibre Express Rifle; and the 1900 introduction of the .350 Mauser actioned rifles. In 1907 the Rigby .470 became Rigby’s main big game double rifle, and in 1912 the .416 Rigby calibre magazine rifle was introduced. Between 1900 and 1960, the Rigby Mauser System was predominantly made in calibres .275, .350 and .416 Rigby, with some .303 calibre rifles in the early days. After that period a wider range of calibres were manufactured. Rigby also made boxlock and sidelock shotguns throughout this entire period. After Theodore Rigby’s death in 1951, the Company was owned by Vernon Harris, whose widow sold the business to David Marx in 1968. Marx later partnered with J. Roberts & Son. In 1995, Paul Roberts introduced the .450 Rigby magnum Rimless, based on the Rigby .416. The company was sold in 1997 to Mr. Neil Gibson, and began manufacturing in the US. In 2010, a group of US businessmen purchased the Rigby assets, discontinuing the manufacture of Rigbys in California. Rigby returned manufacturing to London with J. Roberts & Son, and published the book “Rigby: A Grand Tradition”. Rigby later ended various trademark disputes, and re-acquired the historic Rigby archives from a private owner. In 2013 Rigby was sold to Mauser/Blaser, which has historic ties to Rigby including a collaboration prior to World War I on the development of the Magnum Mauser action for the Rigby .416 cartridge.